From left, previous scholarship winners Natalie Russano (2014) and Telma Stucker (2016), HRIM Coordinator Doug Fee, instructor Frank Benowitz, 2017 winner Lyne Simpson, Don Widmayer (Shari Widmayer's husband), Mercer County Freeholder Ann Cannon, and Martha Hostetter (Anne Lumberger's sister). MCCC's Garde Manger table featured cold salmon and side dishes. Jersey Girl Cafe's Kathy Rana, an HRIM alumna, has participated in the Tasting Benefit since its inception four years ago. 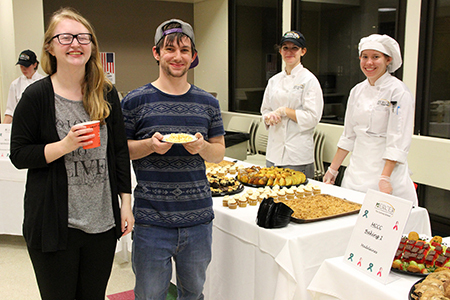 Student Government's Laura Ceras and Alex Villapontoux enjoyed a stop at the dessert table prepared by MCCC Baking students. 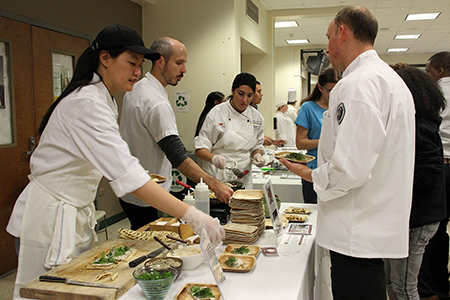 The Fenwick Hospitality Group served Cavatelli Pasta with Lamb Ragu, and House-made Naan Bread with Great Farm Eggplant Puree and Fulper Farms Ricotta. West Windsor, N.J. – A sell-out crowd of 130 guests enjoyed a tasting bonanza at Mercer County Community College (MCCC) on Nov. 8 as the college’s Hotel, Restaurant and Institution Management (HRIM) program hosted its Fourth Annual Tasting Benefit. Dishes were prepared by close to 20 area restaurants and food service companies, along with 30 students from five MCCC culinary classes. Close to a dozen of the professional chefs are HRIM program alumni. Faculty members Frank Benowitz and Doug Fee initiated the event in 2014 as a way to pay tribute to two special chef instructors, the late Anne Lumberger and the late Shari Widmayer. 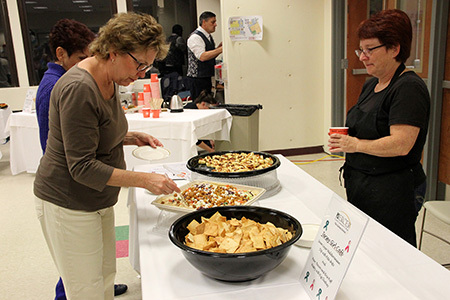 This year’s tasting raised more than $7,000 in scholarship funds for culinary students. 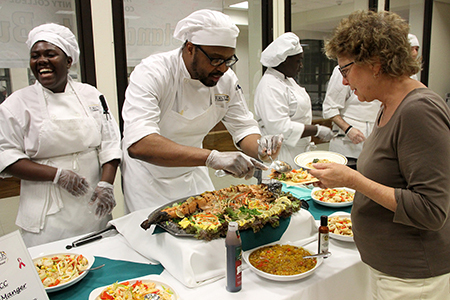 The restaurant chefs stationed around the West Windsor Campus cafeteria served up dishes for every palette – haute cuisine, comfort foods, and ethnic foods, along with gluten-free, vegetarian, and vegan options. Several tables of delectable desserts were prepared by professional chefs and culinary students. Many of the participants and guests have ties to MCCC that go back decades, including those who earned their culinary degrees at the college and/or studied under Chefs Lumberger and Widmayer. 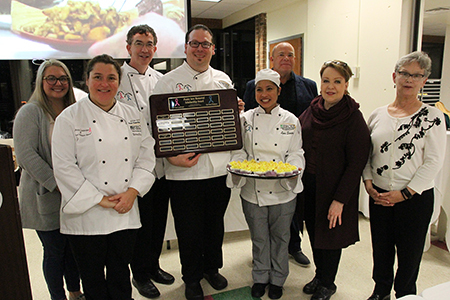 A highlight of the evening was the awarding of the Chef Anne Lumberger and Chef Shari Widmayer Pastry Arts Memorial Scholarship to second-year student Lyne Simpson, who baked ube cupcakes inspired by her Phillipino background. The recipe calls for purple yams, which turn the batter purple, plus a surprise filling of ube halaya (purple yam jam). The cupcake is then topped with coconut buttercream frosting. Simpson prepared more than 100 cupcakes for all to sample. Chef Benowitz explained that Simpson’s dessert met all the winning criteria. “It’s unique, it’s beautiful and it tastes wonderful,” he said as he announced Simpson's name. Scholarship winners' names are added to a plaque that hangs in the Culinary Center. Both Chef Fee, coordinator of the HRIM program, and Chef Frank, Hospitality Club advisor, expressed their deep appreciation to the many organizations and individuals who participated, as well as the many attendees at the event. They also encouraged guests to frequent the restaurants who givie so generously to MCCC culinary students. The participating restaurants/food service companies and their featured dishes included: Barrio Costero (Pork Tenderloin, Mofongo, Pickled Chayote and Epazote Demi); Blend/Brothers Pizza (Red and White Wood-Burning Oven Pizza); Blue Bottle Café (Shrimp Bisque and Chicken Liver Crostini); Fenwick Hospitality Group (Cavatelli Pasta with Lamb Ragu, and House-made Naan Bread with Great Farm Eggplant Puree and Fulper Farms Ricotta); The Gingered Peach (Apple Crumble, Mini Cupcakes, and Apple Cider Doughnuts with Ice Cream); Hilton Garden Inn – Westampton (Mini-Pulled Pork Sliders with Fried Shallots, and Homemade Spicy Pickles); Jersey General Salsa Company (Pan-seared Sea Scallops with Jersey General Mango Salsa); Jersey Girl Café (Seven-layer Mediterranean Dip with Pita Chips, and Pear, Bacon and Brie Puff Pastry with Fig Chutney); Oni Ramen House (Bao Buns: Pork Chashu with Pickled Red Cabbage and Roasted Squash); Palace of Asia (Harabhara Kabab, Chicken Tikka Masala, Jeera Rice, and Assorted Breads); Princeton Wegmans (Deluxe Sushi Assortment); Ravello by Toscanos (Short Rib Arancini Stuffed with Aged Cheddar and Topped with Apple Horseradish Relish, and Butternut Ravioli with Buffalo Fresh Mozzarella and Brown-Butter Sage Sauce); Small World Coffee (Brewed-to-Order Crispy Hippie, Morning Glory, and Decaf House Blend); Sodexo – Bloomberg (Roasted Butternut Squash Risotto with Pesto Shrimp, and Truffled Duck Fat Crostini); Stone Terrace by John Henry's (Lobster Mac n’ Cheese, and Boxer Salad); TerraMomo Bread Company (Assortment of Breads); The Yankee Doodle Tap Room of Nassau Inn Princeton (Jim Beam Bourbon Bacon Meatballs); and Trattoria Procaccini (Mama's Meatballs). The instructors were especially proud of the contributions of their students. MCCC’s Little Skillet Food Prep II Class prepared Cream of Sweet Potato and Apple Soup; the Baking 1 Class made Madeleines and Baking 2 made Rainbow Cookies; the Garde Manger class prepared Whole Cold-Prepared Salmon; the Experimental Kitchen Class created Vegan Tacos; and the MCCC Hospitality Club made its signature Bananas Foster to order. Mercer County Technical Schools’ Culinary Arts Program participated for the first time, serving Duck Confit with Root Vegetable Puree, Cranberry Conserve, and Microgreens in a Wonton Cone. Guests had the opportunity to bid on Tricky Tray silent auction and raffle prizes for gift certificates and other items donated by participating organizations. The Event Planning Class organized that portion of the evening benefit. More photos are available on Facebook here. The Chef Anne Lumberger and Chef Shari Widmayer Pastry Arts Memorial Scholarship Fund continues to accept donations. Gifts may be made online, or with a check to the MCCC Foundation, P.O. Box 17202, Trenton NJ 08690 made payable to: MCCC Foundation, with “Chef Anne Lumberger and Chef Shari Widmayer Scholarship Fund” noted on the memo line.